CLOVIS, N.M. -- A 25-year-old man told police he was asked to kill a 23-year-old woman who was found dead in a southeast New Mexico park, according to a criminal complaint. Accused killer Matthew Jennings told authorities someone wanted revenge against Ariel Ulibarri, but did not say who. "What happened that day ... it's just ... what happened to her ... it was just revenge ... someone asked me to do that," Jennings allegedly told police. The complaint said Jennings did not know Ulibarri. Clovis authorities say Jennings will be charged with murder and tampering with evidence. Police said Jennings confessed Tuesday to the stabbing death of Ulibarri. Investigators say they matched DNA from the state crime lab to a bloody knife found at the scene. Ulibarri's body was discovered Nov. 9. Authorities say her 6-year-old son was found wandering in the parking lot of the Goodwin Lake Trails Walking Park. He wasn't injured. Police say in the complaint that when officers went to Jennings' home, they found it "booby trapped" with ropes apparently left to trip anyone attempting to approach the residence. 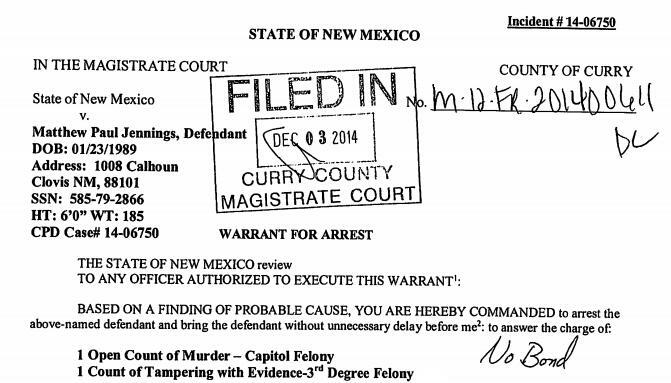 According to the complaint, Jennings admitted to swinging the knife as hard as he could into Ulibarri's chest. Before striking her, he said she told him, "don't do it, don't do it, because I have an older brother who will kick your (expletive)." Jennings said Ulibarri's son took off toward the parking lot after being told to "run," the complaint said. The suspect also showed detectives a scar on his hand, which he reportedly claimed was from the stabbing, according to the complaint. Police say officers patrol the 40-acre park but have had very few trouble calls.